October 24th is NAV 2017 launch day – Microsoft Dynamics NAV 2017 is nearly here! And a great new feature is Embedded Power BI. 365 Talent Portal will be covering many aspects of NAV2017 in our blogs, as well as our NAVcast webinar on launch day, October 24th. So please register now, or read on, or do both…..
With Dynamics NAV 2017, Microsoft is taking the opportunity to connect it ever more closely with other Microsoft products such as Office 365 and PowerBI, under the banner ‘Two Worlds together’. Here is another in our series where we look a new features of NAV 2017 – today, the likely enhancements in Power BI integration. For some time, you’ve been able to create insightful charts and reports from NAV using Power BI. Power BI can sit on one, or across many, of the Microsoft products, for example either by using Power Query which can be enhanced with measures, calculated columns and tables from a number of sources, or by plugging into OLAP Cubes that are connected to Dynamics NAV and other sources, to build the data model. Based upon this data model you can create reports that visualise your information, and also combine these into dashboards. In NAV 2017, direct integration to Power BI has been made tighter so now you can use embedded Power BI to easily create visualisations of your NAV data and make them centrally available for future use, or for others to use. 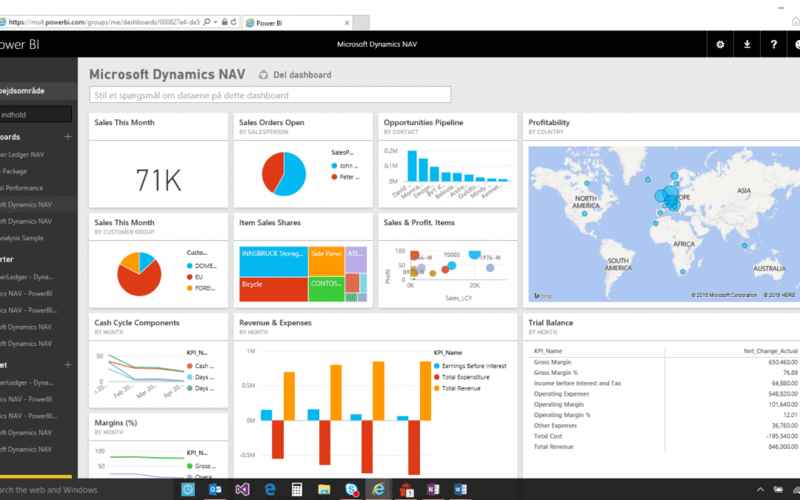 As an accelerator, you can leverage the new Microsoft Dynamics NAV 2017 Power BI Content Pack to get started. It contains many useful quick start sample reports that can be copied, customised, and published. Power BI security enables you to manage both the creation and viewing of the reports. Users will be able only create reports for data sets that they have security access to within Microsoft Dynamics NAV 2017. Only users that have access to the finished reports may view them. Any report that is created in Power BI may be made visible on the Microsoft Dynamics NAV 2017 role centers. This enables users to get the information they need to perform their job right from within their role center. There is more in the Dynamics Learning Platform, including how to create and perform a walk-through demonstration of the embedded Power BI capabilities. For details of how to access this great resource, please see below. If you work for a Microsoft Partner, look at the Dynamics Learning Platform (DLP). If you are a freelance or independent Dynamics consultant, we’re delighted to say that you can now get access to specialised Microsoft Dynamics training and professional resources via 365 Talent Portal. For those who like information in bite sized chunks over time, we’ll also be publishing more in this series over the next weeks. Keep a track here. And finally, there is the Microsoft Power BI web site here. About us: 365 Talent Portal is the first online platform that enables thousands of Microsoft Dynamics consultants to improve their technical, consulting, and soft skills, as well as advertise their profiles whenever they choose to look for work. This profile gives Microsoft Dynamics partners and end-users instant, direct access to the consultants if they want to be contacted. With a network spanning 114 countries, 365 Talent Portal allows companies to search for consultants based on their detailed skills, rates and available dates, to find the best consultants for their projects. Companies can find and employ them on a very low cost model on either a freelance or permanent basis, without incurring the hefty fees typical of recruitment agencies. To find and hire excellent Dynamics resource, please go to www.365talentportal.com.